Photo (left): Jay Finneburgh / AP — Iraq War veteran Scott Olsen lays on the ground bleeding from a head wound after being struck by a projectile during an Occupy Wall Street protest in Oakland, Calif. Olsen suffered a fractured skull while marching with other protesters attempting to reestablish a presence in the area of the disbanded camp, said Dottie Guy, of the Iraq Veterans Against the War. Police Chief Howard Jordan says an internal review board and local prosecutors have been asked to determine if officers on the scene used excessive force. OAKLAND — Scott Olsen, a 24-year-old Marine who served two tours of duty in Iraq, stood calmly in front of a police line as tear gas canisters that officers shot into the Occupy Oakland protest Tuesday night whizzed past his head. The something was a projectile that apparently came from police lines, fractured Olsen’s skull and put him in Highland General Hospital. Doctors upgraded his condition Thursday from critical to fair, and said they expect him to make a full recovery. His parents flew in from Wisconsin and spent Thursday at his bedside. When they arrived, Olsen “just blossomed,” said Highland’s chief of surgery, Dr. Alden Harken. Olsen’s injury added to the national attention focused on Occupy Oakland in the aftermath of the repeated police tear-gassing of protesters Tuesday. In Las Vegas, protesters projected a photo of the Marine in uniform onto the corrugated-metal side of a building at their camp, the Associated Press reported. Vigils for Olsen were planned at Occupy sites in other cities. 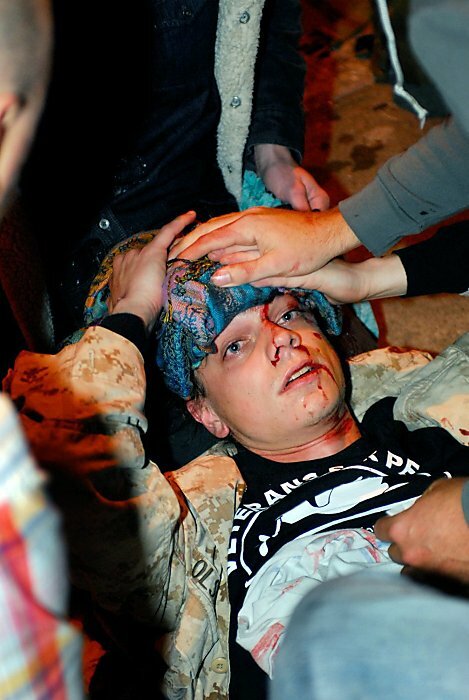 We are very happy to learn #OccupyOakland protestor and Iraq War vet Scott Olsen’s condition had been upgraded to fair. Olsen, a Daly City resident and member of Iraq Veterans Against the War, fell to the ground after police lobbed or fired an object – possibly a tear gas canister – at a group of protesters. One protester can be heard screaming “What the f-” at police as the device emits a loud bang, while a demonstrator angrily pounds his sign on the street. The group eventually carried Olsen away. Officers from 18 law enforcement agencies were on the streets of Oakland Tuesday night, and authorities said they are trying to determine which officers were involved in Olsen’s injury. Quan said officers from outside agencies had been told they had to abide by Oakland police procedures. Olsen knew he might be arrested, but didn’t have any idea the demonstration would get as violent as it did, Shannon said. “He wouldn’t be able to comprehend it,” the doctor said. Chronicle staff writer Henry K. Lee contributed to this report. This article appeared on page A – 15 of the San Francisco Chronicle.